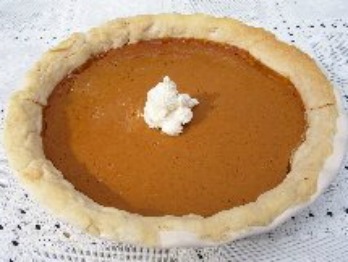 Pumpkin Pie Recipe an old fashioned homemade pie from scratch. A lightly spiced recipe from a 1937 issue of Good Housekeeping Magazine, made with brown sugar, evaporated milk and cream. This delicious pie is easy to make with canned pumpkin all year. Top it with our Homemade Whipped Cream (recipe is included) and it will become a favorite in your home. Stir eggs and sugar together. Mix in pumpkin. Add salt and spices and stir until well mixed. Add water to evaporated milk and stir in slowly. Next, slowly stir in cream until all is smooth. Pour into a unbaked pie crust. Bake in a preheated 425F. oven for 15 minutes. Turn down heat to 325F. and bake another 40-50 minutes until center is firm or a knife stuck in center comes out clean. Remove from oven and cool on a rack for a couple of hours before serving. To serve top with Homemade Whipped Cream (recipe below) or ice cream. *Top milk is the cream that rises to the top of unpasteurized milk. You won't find it in a grocery store. Only from a farmer or all natural dairy. You can just use cream or half and half milk. Tip: If crust starts to brown too much before pie is done, place strips of aluminum foil around outer edges. Whip cream on high speed slightly and start adding sugar gradually while whipping. Spoon or pipe onto pie as desired. This pie is also delicious served "a la mode" (topped with ice cream). TIP: If you would like enough whipped cream to cover entire pie use leftover cream from the above Pie Recipe. Adjust the sugar accordingly. Stir in spices, salt and flavoring. Mix thoroughly. Bake in preheated 425 F. oven for 15 minutes. Reduce heat to 350 F. and bake another 45 minutes or until tests done. Sprinkle top with pecans and add whipped cream, if desired.